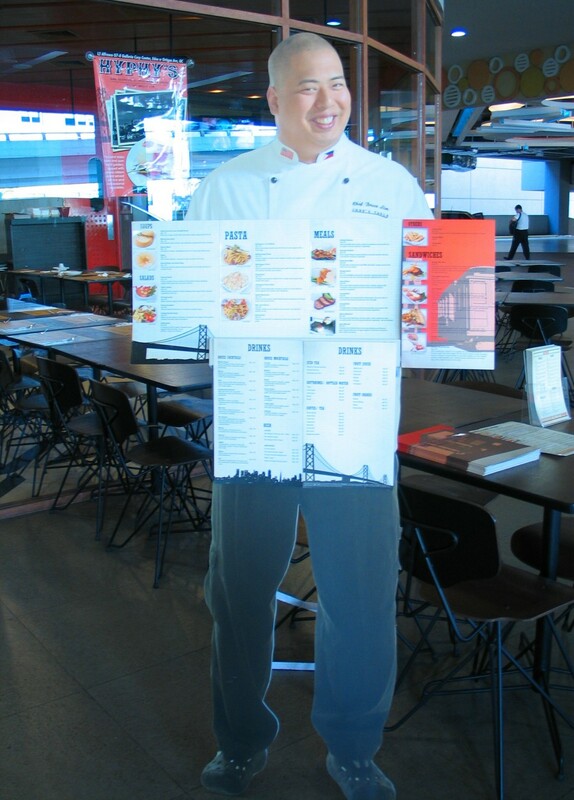 I first learned about Chef Bruce Lim when I saw an episode of Tablescapes... Life on a Plate. I was impressed by his infectious love for Filipino food and more importantly the wit by which he delivers it to his audience. And so, given the opportunity to meet him and have lunch with him at his restaurant, Hyphy's I was beside my self in glee. 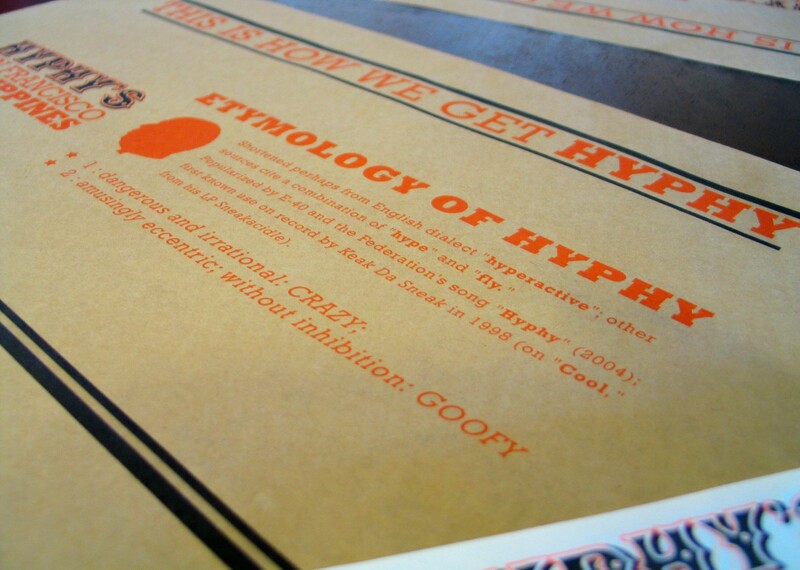 The first thing that I noticed as I walked through Hyphy's glass doors was the cheery and laid back interior of the restaurant. 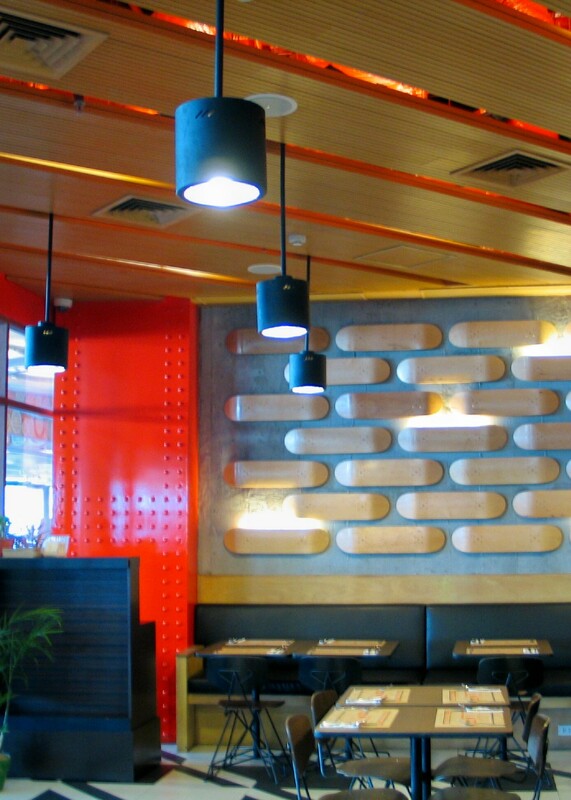 Maybe it's the chairs reminiscent of elementary school (they mirror the ones at Chef's Table, also by Chef Bruce), the houndstooth-like pattern on the floor, the "skateboards" that flanked one wall, the riveted red iron pillars channeling the Golden Gate Bridge, or the wooden planks that served as the ceiling. Or maybe it's all of these elements combined. The point is, it's a place that if personified would call out, "Hey man, come on in!" 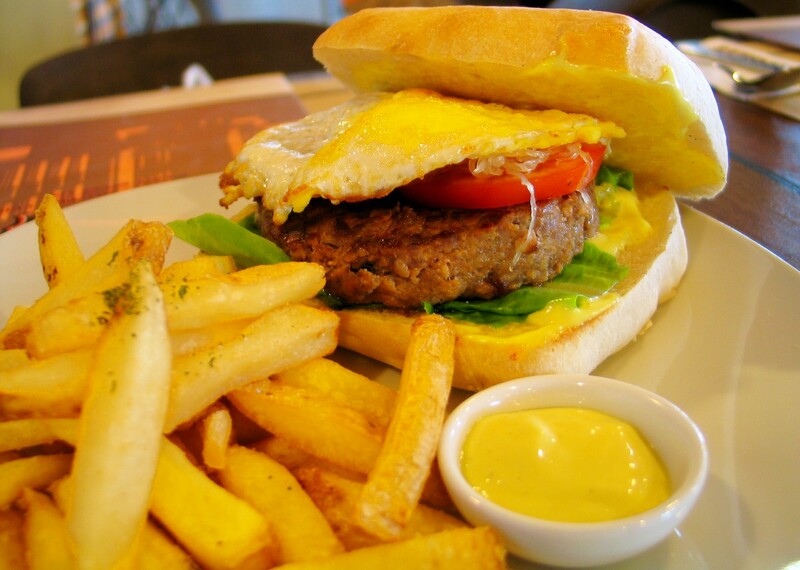 topped with atchara and a fried egg. Served with potatas. 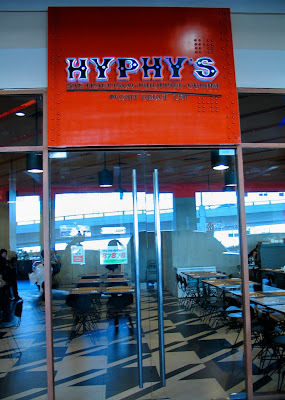 Hyphy's happened when Chef Bruce wanted to bring the kind of food he grew up with in San Francisco to the Philippines. We are not talking about food that is completely foreign here but something which has both elements of San Francisco cuisine and Filipino heirloom recipes, owing to his Filipino heritage. 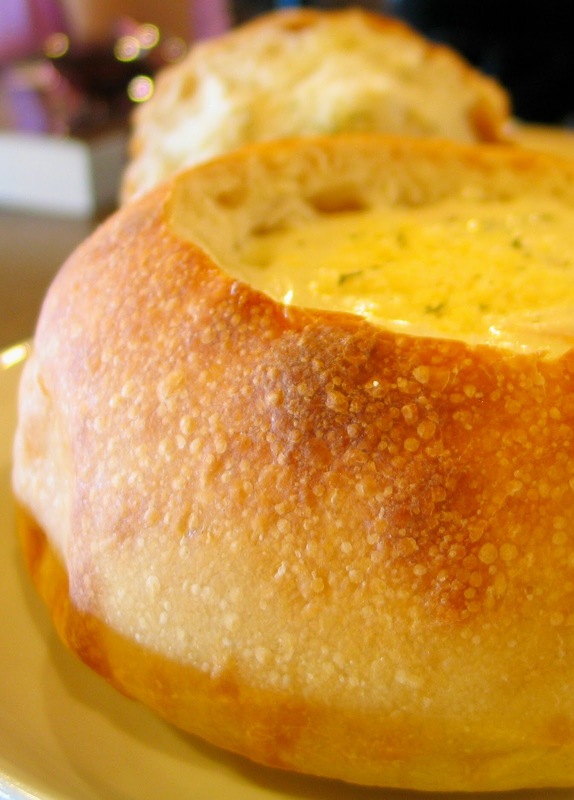 If there is one food that could represent San Francisco cuisine, what would it be? "Clam chowder." Chef Bruce answers with a huge grin. The Pier 39-inspired Clam Chowder in Hyphy's is indeed good, comforting in its creaminess and happily bursting in clams. And the sourdough bread that it is served in is delightful. I clawed through it with my soup spoon like termites to old paperback novels after I finished the chowder. 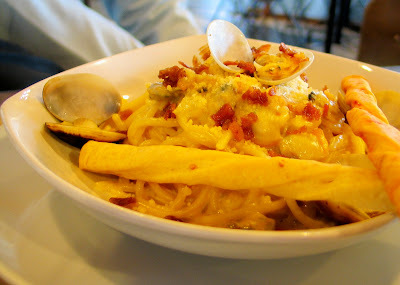 As if the Clam Chowder wasn't enough to satiate my mood for clams that day, I also had Clam Pasta. It was a toss up between that and the Dolores Park Burrito. But the lambanog butter in the Clam Pasta called me by name. Who the heck says no to lambanog butter? 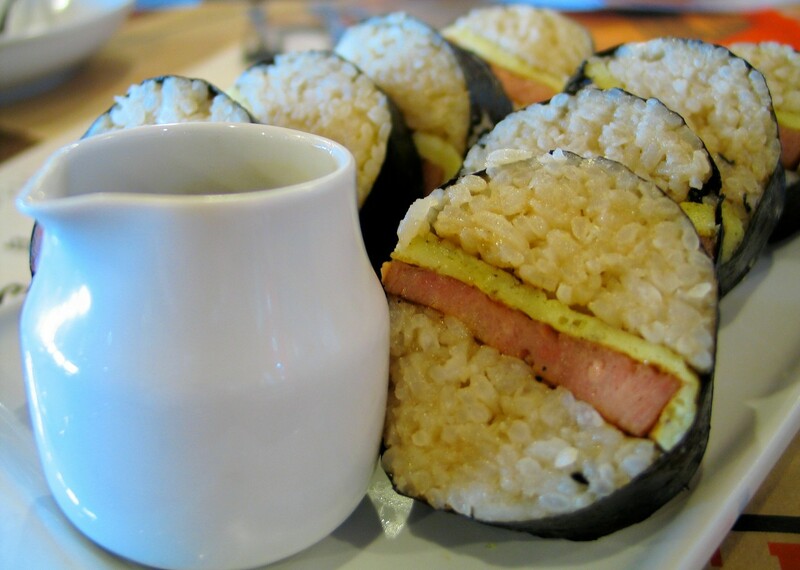 A best seller on the menu that has a tongue-in-cheek kind of air to it is the Spam Masubi, "slices of Spam topped with rice and egg wrapped in seaweed and served with a sweet soy sauce." The story behind the Spam Masubi? Chef Bruce loves fishing. Spam Masubi became his favorite fishing food because it's a delicious and satisfying meal that can be eaten with one hand while holding a fishing rod steady on the other. Fits conveniently in the pocket, too, Chef Bruce muses. Another Hyphy's best seller that has quaint beginnings is the Calamansi Tuyo pasta. The idea started from Chef Bruce's young nephew when he asked- why don't you put tuyo in spaghetti? It turns out, uncle Bruce could. The dish is such a hit, you find it not only on Hyphy's menu but also on Chef's Table's. Following this why-don't-you tradition in dreaming up pasta recipes, is the Kalderetang Pasta which is a "savory peppery tomato sauce tossed in pasta and topped with braised beef." Chef Bruce's views on why Philippine cuisine has not made as big a splash in the world market as our Asian neighbors are insightful. He believes, for instance, that it would be a big help if the government makes an effort to select a version to serve as a standard for each Filipino dish and thereafter promotes this version to the world (as part of the government's program to boost Philippine tourism, perhaps). Admittedly, there are as many different versions of every Philippine dish as we have regions, provinces even (Case in point, the Adobo). 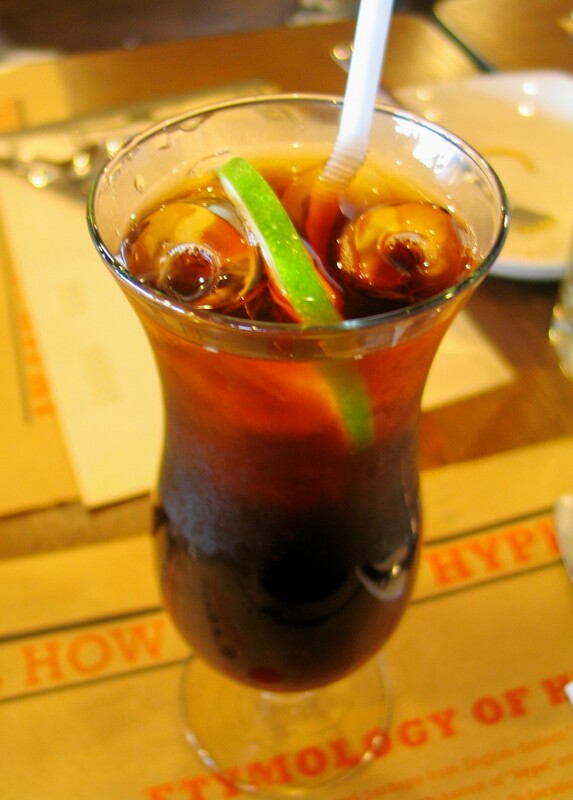 This makes it difficult for Philippine cuisine to establish an identity that is recognizable to non-Filipinos. This standardization of Philippine cuisine should by no means alienate regional versions, Chef Bruce adds. Instead, it should serve mainly to introduce Philippine cuisine to the world and, if all goes well, make Philippine cuisine popular enough for the world to want to try the country's other versions. Come to think of it, most if not all of the more popular Asian cuisines (e.g. Thai, Chinese, Japanese) are conglomerates of regional versions, just like ours. To the remark that most Philippine dishes are not quite pleasing to the eyes, Chef Bruce says plating and presentation is key. 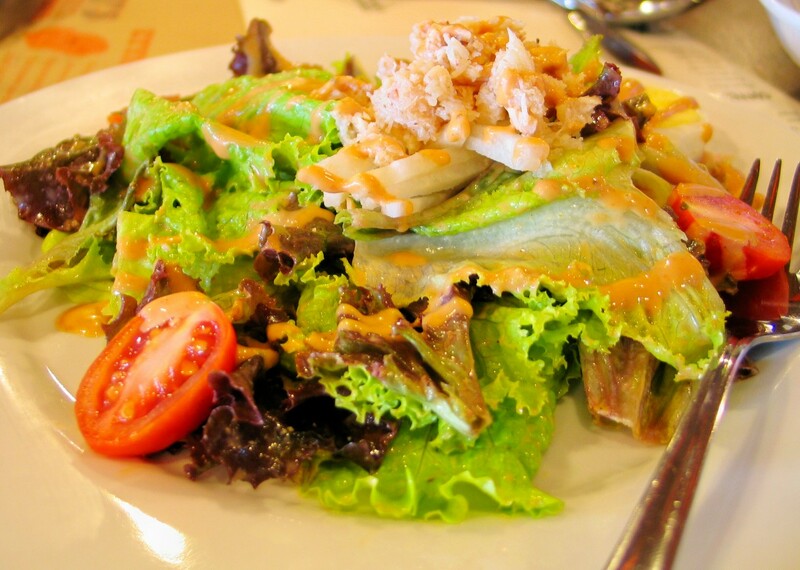 The Philippines is blessed with a diverse selection of beautiful native ingredients. The challenge is to showcase the wonderful qualities of these ingredients and not cook the color and texture out of them. And that is what Chef Bruce tirelessly endeavors to do- as I have witnessed in both Hyphy's and Chef's Table- to present Philippine cuisine in a light that would appeal to any diner without losing the classic elements that make a particular Filipino dish recognizable to the Filipino palate. Hyphy's is located at The Veranda, Robinsons Galleria, Ortigas Center. 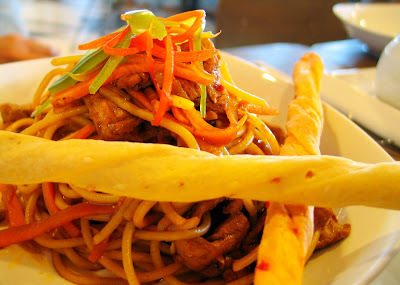 tried the calamansi tuyo pasta :D gooood! It was nice meeting you at HYPHY'S. Sarap ng food!! !